CLEVELAND, OH (WOIO) - Back in the day, famed Democrat, Thomas "Tip" O'Neil said all politics is local. Well, in keeping with that, the Kelley family on East 134th St. is making a personal display of support in the upcoming national presidential election. 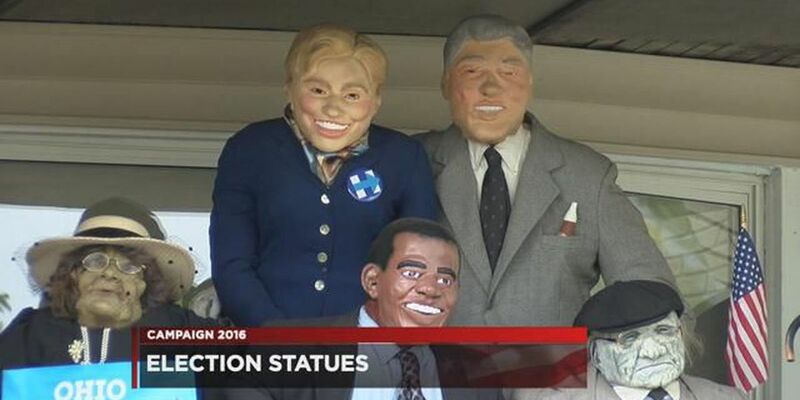 "I made this display for Hillary Clinton," said Byron Kelley, Sr.
Byron Kelley, Sr. handmade mannequins to show his support for Democratic presidential candidate Hillary Clinton. "To remind them that this is very serious election this year. I'm trying to get everybody to realize this is our future and for them to come out and vote," added Kelley Sr. He made two mannequins of the president because he won twice. Bill and Hillary Clinton, you might say has the president's back. Kelley says this is more than just a political display. "If we don't vote then you shouldn't have anything to say about it. I had one politician tell me about 25 years ago, if you don't vote you don't count, you have no reason to complain," Kelley, Sr. said. Latasha Adams is taking her support to the streets of her community. "A lot of people know me and I will be out October 30th, knocking from door to door making sure that everybody gets out to vote and educate them that their vote does matter," Adams stated.